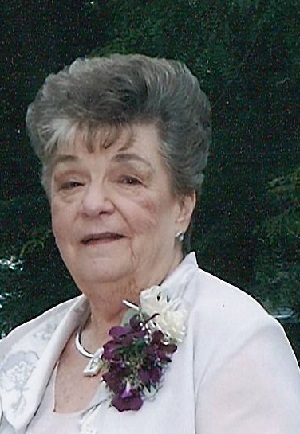 Wareham-Theresa A. Riendeau, 94, passed away on Saturday, April 6, 2019 at Royal Cape Cod Nursing and Rehabilitation Center in Buzzards Bay, Massachusetts after a long and courageous battle with CHF and cancer. Theresa was the wife of 39 years to the late Alfred A. Riendeau. Born in New Bedford, she was the daughter of the late Isidore J. Cournoyer and Cora B. Cournoyer née Lefebvre. Mrs. Riendeau graduated from New Bedford High School in 1942 and later became a beautician and hairdresser. She owned and operated Teresa’s Beauty Salon located on Brock Avenue in New Bedford. Theresa was very loving, generous and caring to her family, friends and friend’s children. She especially enjoyed knitting, sewing and crafting her “gifts of love” for them. She was an avid lifetime gardener and appreciated the unique beauty of each individual flower. Her favorite pastime in her later years was Bingo, where she loved the thrill of winning and cherished the companionship of her circle of friends – not to mention the more than occasional trip to her favorite casino. During her years of illness as throughout her life, Theresa always had a positive attitude and outlook on life. She was a generous person with her time and talents; a woman who always gave selflessly to anyone in need. She is survived by her children: Diane Riendeau-Heefner and her husband Barton of Scituate, MA, Fr. Alfred “Fred” Riendeau Jr. of Stamford, CT and Daniel Riendeau of Wareham. She was the grandmother of Morgan A. Riendeau and Evan D. Riendeau both of Sarasota, FL. She is also survived by many loving nieces, nephews, relatives and friends. Mrs. Riendeau’s funeral Mass will be celebrated on Friday, April 12, 2019 at 11 O’clock in Saint Margaret of Scotland Church, 141 Main Street Buzzards Bay, MA 02532. Relatives and friends are cordially invited to attend. Interment will follow at 12:45 pm in Massachusetts National Cemetery, 1 Bennington Blvd. Bourne, MA.. In lieu of flowers memorial gifts in Theresa’s name may be made to Dana-Farber Cancer Institute at www.danafarber.jimmyfund.org or by mail to: Dana-Farber Cancer Institute, P.O. Box 849168, Boston, MA 02284-9168. To leave a message of condolence for the family please visit www.warehamvillagefuneralhome.com Arrangements by Wareham Village Funeral Home 5 Center Street Wareham.